When uranium is used in a conventional Light Water Reactor, it's converted into plutonium (and if the U238 isotope is used, the result can be fissable Pu239). Even without the danger of weapons-grade plutonium proliferating from a country's stores of radioactive waste, there's not really an easy way to dispose of the byproduct. Our best answer so far has been burying it and hoping for the best. 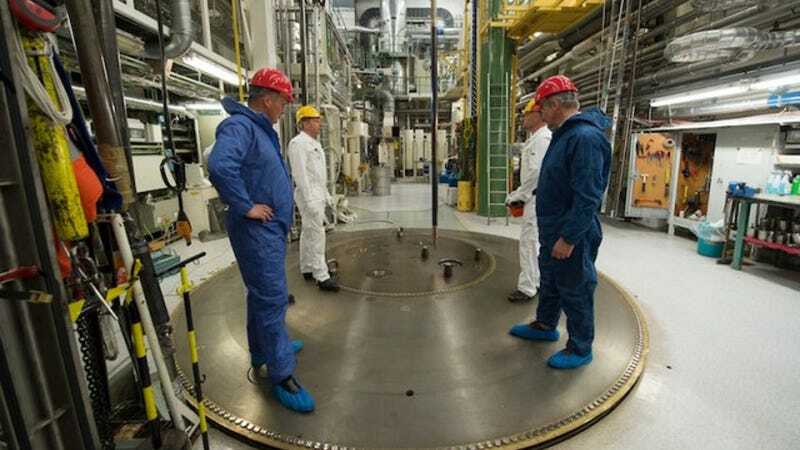 Instead, Thor Energy—a subsidiary of the Oslo-based Scatec group—wants to burn up that store of plutonium to power the very reactors that created it. All its system needs is the addition of thorium. A lot of it. Luckily, thorium (Th232) is an abundant—albeit slightly radioactive—element. It's estimated to be four times as common as uranium and 500 times as much as U238. It's so common that it's currently treated like a byproduct in the rare-earth mining industry. Problem is, naturally occurring thorium doesn't contain enough of its fissable isotope (Th231) to maintain criticality. But that's where the plutonium comes in. What Thor energy did was mix ceramic thorium oxide (ThO2) with plutonium oxide (nuclear waste) in a 90:10 ratio to create thorium-MOX (mixed-oxide). The thorium oxide acts as a matrix that holds the plutonium in place as its used up. This stuff could very well revolutionize nuclear power. Thorium-MOX can be formed into rods and used in current generation (Gen II) nuclear reactor with minimal retrofitting. Ceramic thorium has a higher thermal conductivity and melting point than uranium, meaning it can operate at a lower (and safer) internal pellet temperature with less chance of a meltdown, fewer fission gas emissions, and extended fuel cycles. Most importantly, thorium doesn't convert into plutonium—precisely the opposite, in fact. That is, the process consumes plutonium. We could be looking at a means of not only halting the growth American nuclear waste sites but actually reducing our stores of plutonium while simultaneously reducing the danger of nuclear proliferation. Sure, the thorium system does create waste of i's own, but irradiated thorium doesn't oxidize and remains more stable as it decays. What more could you want?